Here’s the latest star creation – ‘Ethiopia’ Man? WASHINGTON (Reuters) – The skull of an unfortunate early human chewed up by a lion or a hyena a million years ago may help show that our ancestors evolved in Africa and then spread through the world, scientists said on Wednesday. The million-year-old skull clearly belongs to the species known as Homo erectus — a robust early human who stood upright and used tools, the report, published in the science journal Nature, says. It adds to the debate over whether early humans evolved in Africa and then moved to the rest of the world, or whether modern humans evolved separately in Africa, Asia and Europe. Tim White, an anthropologist at the University of California Berkeley who helped direct the study, said the skull settles for him the question of whether humans evolved from a single ancestor — Homo erectus. “This new fossil is really important for two reasons,” White said in a telephone interview. The skull was found in a region of Ethiopia rich in the remains of early humans — the Middle Awash area, about 140 miles northeast of Ethiopia’s capitol Addis Ababa. Henry Gilbert, working on his doctoral degree at Berkeley, found the skull in 1997. It took a year to completely remove the fossilized bone from the block of rock it was embedded in. “When we cleaned the matrix off, we saw these weird scratches all across the top of the skull,” White said. A million years ago, large lions and huge hyenas lived in the area. “They would have had a gape big enough to crunch the entire face away in an attempt to get into the brain,” White said. The result was the skull has no face, but what is left of the cranium is enough for the experts to identify the species as Homo erectus, White said. “This African fossil is so similar to its Asian contemporaries that it’s clear Homo erectus was a truly successful, widespread species throughout the Old World,” he said. Many anthropologists have argued that fossils dating back as far as 1.7 million years actually belong to a separate species of humans, which they have dubbed Homo ergaster. The most recent example of Homo ergaster was found in the former Soviet republic of Georgia. White argues that Homo ergaster is actually an early Homo erectus. Homo erectus was actually a single, widespread species, White said. It did not start to fragment into different species, such as Europe’s Neanderthals, until the Ice Ages separated populations. Examples of Homo erectus include Java Man, found in what is now Indonesia, and Beijing Man, found in modern-day China. These Asian branches never really evolved further and may have been replaced by modern Homo sapiens — but White said there is not yet enough evidence to show what happened. “When you stack these fossils up in time … we see that somewhere between 100,000 and 200,000 years ago, anatomically modern people arose,” White said. These modern people then populated the world. “They walked, but they didn’t wake up one morning and say ‘get out of here — Pakistan looks better.’ They said ‘the hunting in the next valley is better’. It was like a diffusion or dispersion out of Africa,” he said. Let’s look at history, to see if there are any skeletons in the closet of Homo erectus – both literally and figuratively. Many alleged discoveries of Homo erectus have been found around the world. They are said to be smaller than the average human today, with a matching smaller head. But the brain size is within the modern range, with a middle ear structure just like us. Remains found in the same strata and close proximity to Homo sapiens suggest to ‘splitters’1 that H. Erectus and H. Sapiens lived together, but not that they are the same species. 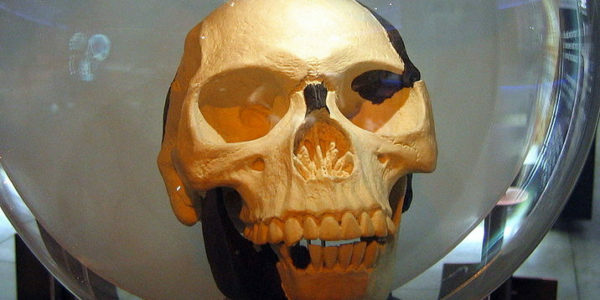 The history of H. Erectus begins in 1891, when Eugene Dubois discovered the so-called Java Man skull. The intrigue surrounding this find includes his hiding a true human skull of very large brain capacity found two years earlier in the same excavation area and strata ……. for 30 years!. the fossils do not belong to one individual. Forty one years later Dubois concluded that Java Man was actually the skull of a giant gibbon, a conclusion other scientists had already reached after the original discovery. A generous assessment of this episode would represent it as an understandable misinterpretation; a realistic one would call it fraud. Despite the finder’s re-thinking of the type identification, scientists today hold that these fossils, now called Homo erectus, were our ancestors. But there is no proof that these fossils have a relationship with any cultural artifacts or tools found in their vicinity. The fossils were never let out of China; only plaster casts, drawings and photographs were exported. Conflicting reports of authenticity were published for 10 years after the initial report. Careful analysis show Peking Man to be probably a large monkey or baboon, not a man. True human skulls were found in the same huge ash pit. Abbe Breuil raised serious questions that Beijing Man was ancestral to humans. Marcellin Boule said the fossil was an animal that was eaten by the true men at the site. During World War II the fossils mysteriously disappeared, leaving no tangible scientific evidence. Project funding was obtained by Teilhard de Chardin, who was also implicated in the Piltdown fraud (no time or space to delve into this one). The cranial capacity of H. erectus fossils, 750-1250 cubic centimeters, falls within the range for modern humans (700-2200 cc). The body skeletons are very similar to modern humans, except that they are heavier and thicker. Of the 77 sites of H. erectus fossil finds, 42 have yielded stone tools and 11 show evidence of controlled use of fire. The form of H. erectus skulls, jaws and teeth are somewhat different and more gross than modern man. Tools found near the fossils are not plentiful and not necessarily linked to the fossils. How about you, reader? What do you conclude? Would you accept the above circumstantial evidence in favor of H. erectus, if presented to you as a juror by the evolution defense team ? As a publisher would you even accept this as a plausible plot for a science-fiction novel? With this background some statements in the Reuters item can now be addressed and challenged. This African fossil is so similar to its Asian contemporaries that it’s clear Homo erectus was a truly successful, widespread species throughout the Old World…. There is another interpretation that is also possible: that the similarity of the fossils from Africa and Asia – in fact, from all around the world – is simply evidence of normal variation within the Homo Sapiens genome during pre-modern times. But evolution’s dictates dismiss such direct logical inference of relationship. Besides, fame and fortune, power and prestige await the scientist who can discover the missing links. Not enough evidence….? Skimpy evidence was never a problem up to now. The progenitor of the entire H. erectus line, Java Man, was based on the proverbial ‘ hank of hair and a piece of bone’. And there is no primary evidence now extant for Beijing Man. Apparently Ethiopian Man will follow in the H. erectus tradition, where less physical evidence strengthens the conclusion. If nothing at all is found, then, H. erectus must be an absolute certainty! They walked, but they didn’t wake up one morning and say ‘get out of here — Pakistan looks better.’ They said ‘the hunting in the next valley is better’. It was like a diffusion or dispersion out of Africa. The million-year-old skull clearly belongs to the species known as Homo erectus — a robust early human who stood upright and used tools, …..
Darwinists date fossils by the layer of earth they reside in, and the layer of the earth is dated by the fossils typically found there. Apprentice logicians can easily identify this common fallacy as circular reasoning. But somehow this elementary error escapes the evolutionists’ notice. Indeed, it forms a key building block for the illusory mental edifice of neo-Darwinism. Mainstream scientists claim sedimentary layers were laid down at a slow, uniform and known rate, so fossils found in the bottom strata are the oldest and the most primitive; they predate man by millions of years. As in a pile of dishes, the first and oldest dish is at the bottom of the stack. This uniformitarian assumption is rarely explicitly stated by mainstream scientists, nor is it often admitted that this premise is testable and falsifiable. When assumed true rather than proven so, this constitutes another fallacy – begging the question, or petitio principii. Rather than just relying on the rock strata axiom, two geologists from the University of California at Berkeley studied Java man using some newer dating techniques. They estimated Java Man was no more than 50,000 years old, not the 1.8 million years previously claimed! [New York Times, January 10, 2001]. Tools and human fossils are repeatedly documented in the geological record, even into the so-called Pre-Cambrian age, which is long before humans appeared, according to the evolutionary scheme of things. As just one example of many such, miners have unearthed a man-made metal sphere from the Ottosdal Mines in South Africa (not too far from Ethiopia), whose rock strata is estimated to be 2.8 billion years old. For an article on this same theme, documenting more manifest contradictions to evolution’s predictions, link to: Is “Flat-faced Man” Your Ancestor? Much larger than the question of the fossil finds’ ancestry is a more troubling mystery – why these contradictions to evolution’s dictates are ignored by the science establishment. Such glaring anomalies would normally signal the advent of a new paradigm to displace the old and embrace and explain the contrary evidence. Not so with the evolution juggernaut. It rumbles forward, driven by non-scientific agenda, refusing to be derailed, oblivious to reality. Welcome to modern evolution science. 1) A ‘splitter’ paleontologist tends to find reasons to split the main trunk of the human ancestral tree into many new branches; a ‘lumper’ tends to consolidate new finds into currently known offshoots. Note that splitters tend to grab headlines (for a case in point, see the Reuters article above) and the lion’s share of new research funding, while lumpers are thought of as boring and uncreative plodders.